Being cared for, or caring for someone, in a care home, nursing home, hospital or at home? Most of our charts are available for purchase as single items. As soon as you need to employ the services of people who don’t know you well, and communicating your needs is a challenge, it is important to be able to let them know what matters to you quickly and easily, so they can spend more time attending to you and not poring over the paperwork. A number of our Care Charts meet this need. You may also wish to consider creating a Mycarematters record, a secure, free, online service where you can upload the non-medical information you’d like anyone caring for you to know. Quick and easy to create, you can print out a copy for use in your own home, and use one of our Display Options to ensure it will be seen by your carers. Once you have a Mycarematters record in place, you can update it as and when required, and make it available to staff in any care setting, either by giving them your Mycarematters Unique Code, or by printing out a copy to take with you. If you, or someone you care for, is moving in to a care home you need to establish how they ensure that every member of staff is made aware of their residents’ needs and preferences. Of course, the regular staff will get to know them, but weekend, agency or bank staff may well have to care for your loved one with minimal information. And even regular staff need to be kept up to date. The care plan is not an appropriate tool for this. Managers frequently admit that staff rarely have time to read the care plan, whereas a wall chart presents the information exactly where the staff need it, on the wall in a resident’s bedroom. It takes a matter of seconds to discover how to avoid traumatic mistakes as well as providing vital information to initiate conversations and build relationships. Care homes will be happy for you to hang a wall chart in your/your loved one’s room. However, the charts work best if adopted by the organisation for everyone being cared for, and they become part of daily life for everyone: all staff, those being cared for and their families. So do encourage the care home manager to buy a chart for each of their residents, and if you have already bought one yourself, we shall be delighted to reimburse you. “An acute hospital visit is like a meat grinder for people with dementia – it chews them up and spits them out” says June Andrews in her book Dementia, The One-Stop Guide. Perhaps this is a slightly harsh generalisation but it is increasingly understood that people with dementia or other cognitive impairment should get out of hospital as quickly as possible to avoid long term debilitating effects. One of the most effective ways to achieve this is to ensure that everyone interacting with the individual knows what matters to them, their likes and dislikes, needs and preferences. One of our Pocket Charts can help but creating a Mycarematters record online is a more efficient way of ensuring that staff are aware of your non-medical needs and preferences from the minute you are admitted. 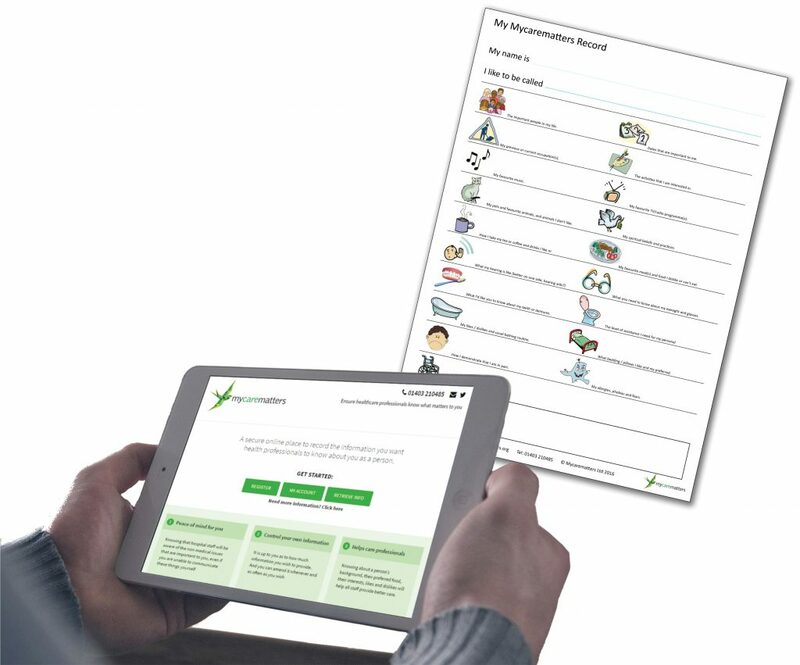 We offer a variety of options for hospitals to display your Mycarematters record so that it is instantly accessible to all staff and volunteers. Do mention the Mycarematters system to staff if they are not already familiar with it and ask them to contact us: info@mycarematters.org or 01403 210485. Regardless of whether they have one of our display options in use, your information should be kept somewhere accessible to ensure that everyone interacting with you can treat you in a person-centred manner. And if it gets lost when you move wards or to another care setting, make sure you have your Mycarematters Unique Code to hand (we supply keyfobs and stickers for this purpose) so it can be reprinted. “We find our Remember-I’m-Me Standard Care Charts an indispensable part of our holistic care for residents… They’ve been in place for over a year now; because they are wipe clean they can be changed as often as needed and have proved very durable.” Ellie Cant, Manager, Furze Hill House, Salvation Army. “I couldn’t possibly have hoped for a better result” Sue Cook, the Older Persons Assessment and Liaison for Dementia (OPAL) team leader at Epsom Hospital, part of Epsom and St Helier University Hospitals NHS Trust. Care Charts UK © 2015-19 All Rights Reserved.